New in Jobfeed: easily spot hard-to-fill jobs! Textkernel released a new version of Jobfeed that makes lead generation and labour market insight even easier. Receive hard-to-fill jobs and monthly analytics reports directly in your inbox! The biggest new feature in this release is the option to receive e-mail notifications (also in Excel) when jobs matching your saved search are still online* after a specific number of weeks. This allows you to easily spot hard-to-fill jobs. Example: Create your search query (for example all jobs for java developer from direct employers with a university degree in London). When saving your search, set up e-mail alerts to automatically receive all new matching jobs in your inbox. By ticking the second checkbox, you will receive e-mails when jobs matching this search are still active after 2, 3, 4, 8 or 16 weeks, allowing you to easily spot these hard-to-fill jobs. * Jobfeed revisits the job pages daily to check whether they are still active. It may occur that jobs are expired but still online. Jobfeed Analytics users will get access to an additional calendar search option. Besides the current options Period (last .. weeks) and Date range (between .. and ..), you will now also be able to search by previous month(s)/quarter(s)/year(s) via the Calendar period option. This new feature gives you to option to easily find all jobs in Jobfeed between the first day and the last day of the previous period(s). This is especially useful for having recurring monthly Analytics reports sent by e-mail. Example: Create your Jobfeed Analytics report (for example profession classes per month). 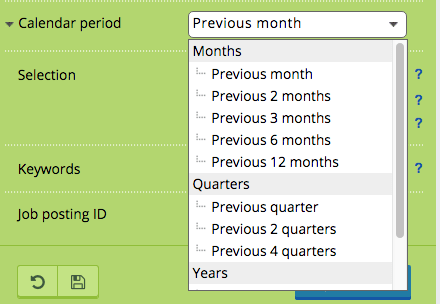 Set the period to calendar period and choose an option (for example previous month). When saving your report, set up e-mail alerts to automatically have new reports at the first day of each month sent directly to your inbox. Interested in Jobfeed Analytics? Contact Textkernel for upgrade possibilities. Textkernel added some changes to the new version that make Jobfeed even more user-friendly. Jobfeed Excel users will notice that the Excel export button moved from the week overview to the search results page. When you create your search query, you will see all jobs matching those criteria. In this overview, you can directly export these results via the new button on top, without having to go back to the week overview. Interested in Jobfeed Excel? Contact Textkernel for upgrade possibilities. 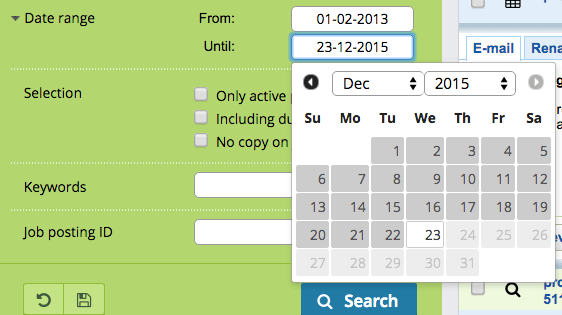 Users of Date range will benefit from an optimised version that makes it easier to select the dates. Want to know more about Jobfeed? Contact Textkernel or request a demo.